I had booked the trip of a lifetime and purchased a present to myself; my first DSLR camera was packed safely into a shiny new rucksack. I was fizzing with excitement in anticipation of visiting one of nature’s greatest treasure chests – Borneo. Situated in the Malay Archipelago, the third largest island in the world is a paradise for nature lovers. I imagined birds adorned with shimmering rainbow colours, luminous butterflies and animals with long noses or bulging eyes, many of which are endemic to the island. But the creature that most nature lovers hope to see is the forest island’s jewel in the crown; the great red ape of the jungle, the orang-utan. I had been consulting with local guides and tour operators about where to go to give myself an opportunity to see a wild orang-utan, in its natural habitat. This seemed like a long shot, and with every conversation the chances of seeing one became more and more unlikely. It was certainly possible to see animals that have been rescued, rehabilitated and re-released into controlled and protected environments, and to visit the rehabilitation centres, but a wild animal was the proverbial needle in a haystack. I pieced together a trip that would take me to the Sepilok Orang-utan Rehabilitation Centre as a stop on the way to a jungle lodge on the Kinabatangan River in Sabah, Malaysian Borneo. 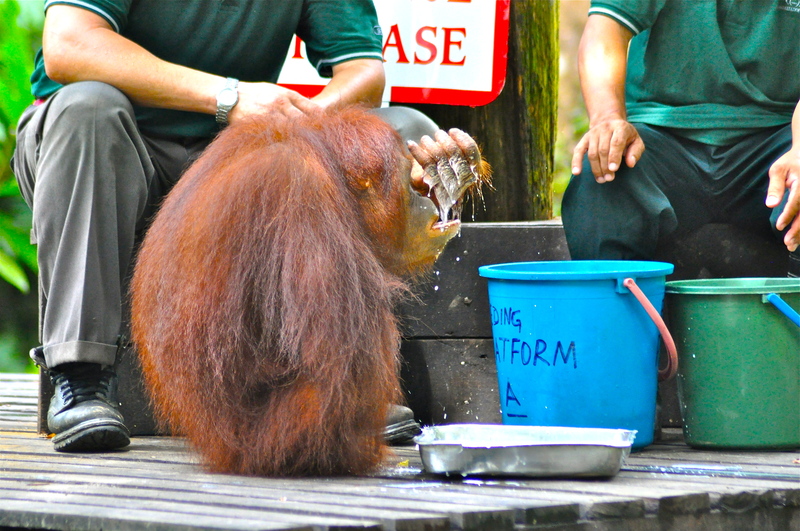 At Sepilok I would be able to see orang-utans that were not in a cage, while learning about the challenges the species is facing and the good work being done to protect them. This was an exciting prospect but lightly tarnished by the realisation that a wild sighting was not going to happen. Sepilok is a fantastic facility where wonderful people do extraordinary things. Founded in 1964, the task is to take care of baby or young orang-utans, orphaned by deforestation, hunting or through the pet trade and care for them, as a parent cares for a child, until such time as they can take care of themselves. In the wild a baby orang-utan will stay with its mother for 6 years, during which time she will be cared for 24/7 and taught the skills needed to survive in a tropical rainforest. As a human teaches baby to walk, the orang-utan mother teaches a little one to climb. This role now falls to the human carers. When the orang-utan reaches a level of self-reliance it is released into the surrounding, protected forest where staff continue supplementing the diet of the animals by providing milk and mashed banana. 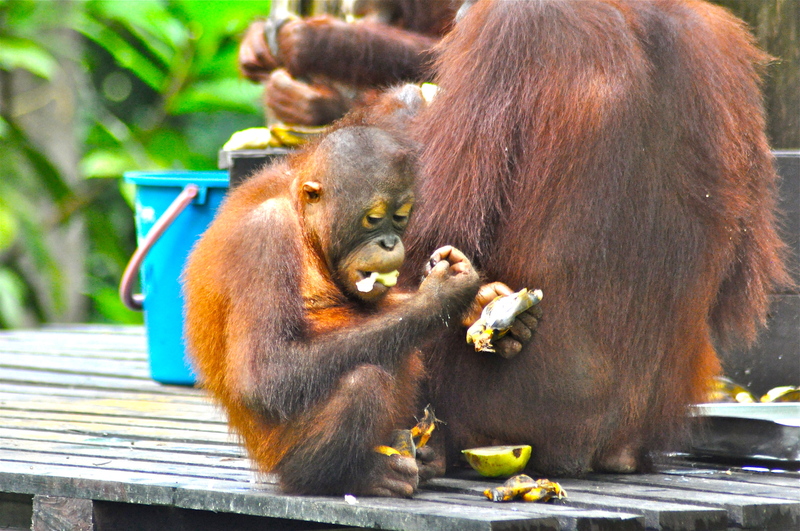 This daily supplement supports the orang-utan during their transitional stage as they learn to forage for themselves. Due to the bland nature of the banana and milk diet, the orang-utan becomes bored with it which encourages foraging for nature’s delicious, sweet and sour forest fruits. World Wildlife Fund (WWF) statistics tell us that the Bornean orang-utan population has dropped by over 50% in a period of 60 years, while the felling of 300 million trees has resulted in 55% of its habitat being lost in the last 20 years alone. These eye-watering numbers present massive challenges, as around 90% of the wild orang-utan population live outside of protected zones. The orang-utan faces many challenges in the modern world, but the primary challenge is habitat destruction on a massive scale, as the human demand for palm oil and timber grows. The Oil Palm is a species of Palm tree that originates from Africa and grows only in the tropics. When grown commercially it is a high-yield, low maintenance crop, making it a perfect crop for growing in Malaysia and Indonesia. The oil produced from the palm kernel is now used in 50% of packaged products in Western societies, in the production of bio-fuels and for cheap cooking oil in developing countries. The compressed palm kernel cake is used as cattle feed. If you have ever flown low over Malaysian Borneo, Peninsular Malaysia or Indonesian Sumatra or Kelimantan, you will understand the extent of the challenge. It is breath taking to witness monoculture on such an industrial scale. It actually brings tears to the eyes. Mile after mile of Palm forest, like a great green carpet, rolled out to the horizon. Little or no native wildlife inhabits these jungles imported from Africa. Only around 15% of primary rainforest mammals can survive in the sterile palm plantations. A narrow wooden longboat carried me on the journey down the winding, soupy Kinabatangan River to my jungle lodge base, for the second part of my trip. I woke up before sunrise on the second morning in the lodge. The previous 24 hours had been like a dream. I had been immersed in a paradise of Proboscis monkeys, Long-tailed and Pig-tailed macaques, various kingfishers, hornbills, owls, reptiles, amphibians and much more. The thick air clung to my skin and caught in my throat as I squelched my way to the river and wobbled into my seat in the longboat. We set off up stream and my guide steered the narrow wooden vessel into the centre channel for another day of searching for wildlife. We eased to a gentle chug against the flow when something caught our eye; a bundle of reddish brown in a lush green fruiting fig tree. The guide stood up and squinted, I lifted my binoculars. It couldn’t be, could it? Yes it was! 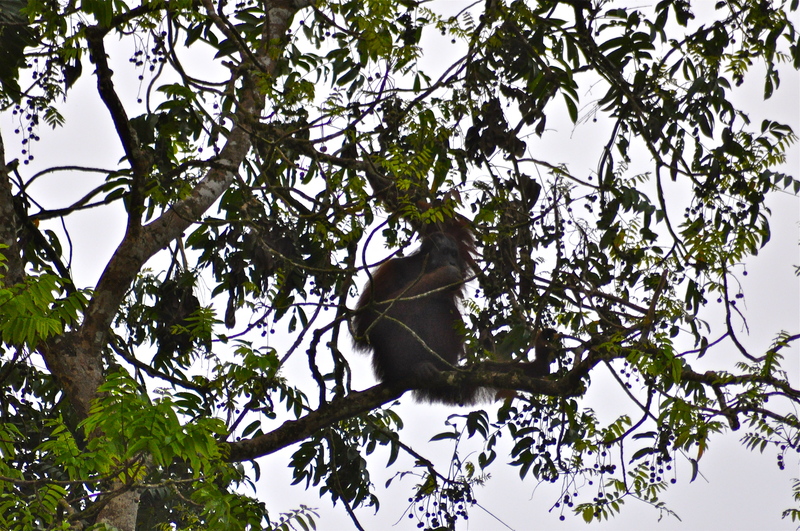 An enormous and truly wild male orang-utan! I had all but given up on the idea of seeing the great ape in the wild. 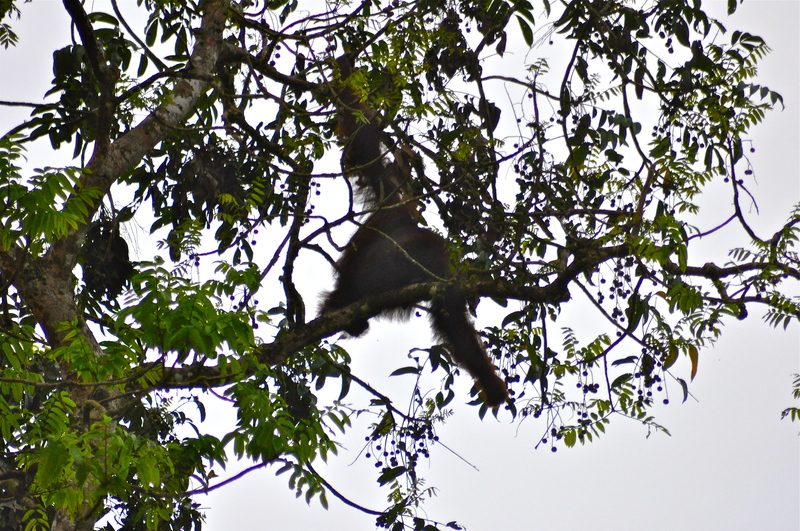 All evidence pointed to them being too endangered, too shy or the jungle being too dense but here, in a fruiting fig tree overhanging the Kinabangan River, was a huge male, dining on a breakfast of fresh figs. He regarded me with nonchalant ease. I regarded him with awe. This was my dream come true! The Bornean orang-utan is one of two orang-utan species alive today, the other being the Sumatran animal. 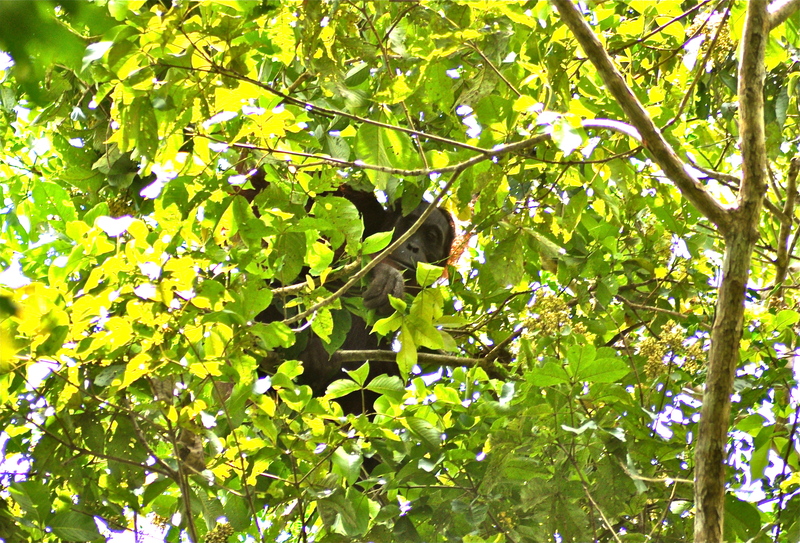 The Bornean species is the largest tree dwelling animal on the planet, with fully grown males weighing up to 100 kg (220 lb). Although not a tall animal, the powerful arms can grow to up to 1.5 meters (almost 5 ft.) in length. This hefty male was an impressive sight as he maneuvered through the tree with graceful ease, unfurling those long, powerful arms towards the sweet figs growing tantalisingly on the tips of the thinnest branches. I sat admiring this awe inspiring creature for some time before submitting to the drift of the murky waters, allowing it to carry us silently away, while he finished his breakfast in peace. It is a difficult decision to move away from an encounter with an iconic and endangered species, knowing that you might never have a chance to experience them in the wild like this again. Respect for the animal’s well-being must always be the priority, so reluctantly we set off to continue searching for the river’s wildlife. A couple of hours passed before we returned to the lodge to enjoy a delicious brunch of sweet river shrimps and sumptuous fruits of the forest. I dined to the shrill of cicada, in dream like disbelief at the morning’s sighting. My trip had already given me more than I could have hoped for. Jungle afternoons are generally spent doing nothing but relaxing as it is too hot for wildlife that is trying to avoid the heat of the day, but I did not want to waste a minute of my trip. With translation help from my guide, I negotiated with a local village kid to take me for a jungle walk, for a couple of hours. I was told that I might see some of the forest birds that I did not see along the river and it would be good training for the kid. We agreed a fee, I picked up my camera and some water and we set off on foot. Doused in sweat, we clambered and hacked our way through steaming, leech invested jungle, which seemed to close its jaws behind us, when we heard a load crash in the tree above. The kind of sound that freezes fear into your body and makes your heart beat so fast that it feels like it might burst out of your chest. The kind of sound that makes us fear monsters and murder in forest shadows. Moments passed and silence returned. We calmed our nerves a little and circled the tree trunks from where the sound came, looking up into the canopy above. Suddenly a huge, thick fingered hand reached through the veil of gold-dappled leaves, pulling them to one side, revealing the face of a mighty female orang-utan. We stared into each other’s eyes, my heart was thumping hard and my body was shaking, the floor seemed to fall away from under my feet as I was drugged with adrenaline. There was a moment of real fear; this was a massive creature, only a few meters above my head and I was on foot in her world, at her mercy. Fear soon dissolved into wonder. That moment where we looked into each other’s eyes remains the most intensely emotional moment that nature has afforded me. A feeling of looking back through millennia of life on earth, back through a journey of evolution that led to this moment in time, where we two regarded each other with curiosity. We are told that the orang-utan shares 97% of DNA with humans. Is it surprising that we persecute our closest living relatives? As a species, we continue to persecute each other over differences in race, religion, nationality, gender, sexuality and any other distinguishable difference that we can grab hold of. I guess at some stage we decided that 3% DNA difference is just too much to qualify for a life of peaceful existence in the planet’s most remote jungles. The WWF and others continue to work with governments and plantation owners to assist with the development of sustainable forest management techniques. In our current global model it is unacceptable to be critical of the people of Indonesia and Malaysia as they work with the resources available to them to raise standards of living in communities. We can support them by ensuring we buy products containing only palm oil from sustainable plantations that respect the natural habitats of Borneo. In markets where information is available, look for the RSPO mark of approval. This means that the palm oil within, supports thriving natural habitats and community development. Responsible tourism targeted at viewing these extraordinary beings in their wild habitat will help to incentivise protection programs. I do believe that it is important to support the rehabilitation centres who work to restore orphaned animals to the wild, but this alone is not enough. 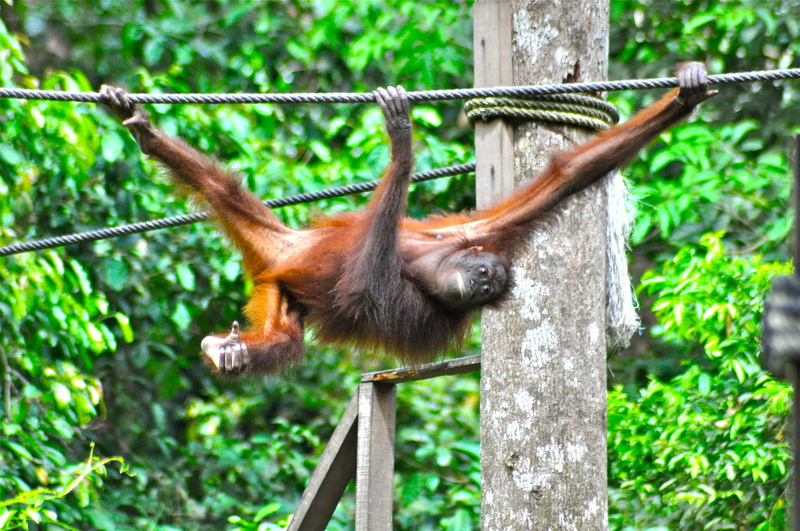 Take some time to go on a real adventure to see orang-utans that have never known captivity. There is no comparison between the experience of seeing rehabilitated animals versus a truly wild populations. I recently visited the Smithsonian museum in Washington DC, where they had a perfectly preserved specimen, expertly set by a taxidermist in a classic tree climbing position. It occurred to me that this rather cold encounter could be the only chance that our children or grandchildren get to experience these magnificent creatures. Standing in dense jungle, looking into the eyes of that wild orang-utan remains one of the most moving and powerful experiences of my life. I hope that we are courageous and wise enough to ensure that this opportunity is available to others for centuries to come. Help to connect people with wildlife experiences by sharing this post on social media. What a wonderful experience, thanks for sharing. Borneo has long been on my travel wish list but I have not yet managed to go. It has also occurred to me that most people will only get to see shell forms of animals in zoo’s and circuses, (or stuffed in museums) and the parents give me the same excuse when they take their children to such places – this is the only chance for them to see these animals. We live in a sad world, but experiences such as yours give me hope. Thanks again. Thanks for taking the time to comment! 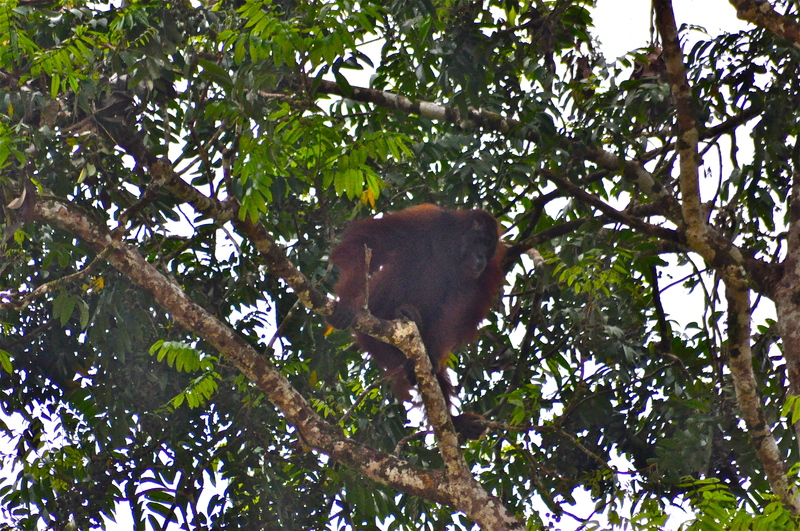 I hope you get to Borneo, it really is a gem! It is sad that our children may only get to experience some animals in cages or museums. I comfort myself by believing that some of those children will be inspired to make a difference to wild habitats. I have also been to the same place to see these wonderful and gentle animals being rehabilitated by truly amazing people. It is an eye opener, so thank you for sharing this with as many people as you can. Many animals around the world need help if they are to survive and its because people such as ourselves value their existence in the world. What a wonderful experience!! I really enjoyed your post. It brought tears to my eyes! Very touching! What an amazing experience, David! The fear and the thrills and the privilege of seeing these creatures would have made it a real adrenaline rush. What beautiful creatures they are. Thank you for sharing these shots and a story everyone needs to read. Sadly palm oil is such a popular product but there are many alternatives. I actually know someone from my school days who has been made very wealthy by promoting sales and distributing palm oil from these areas. I’d rather have a simple lifestyle than be wealthy as a result of the suffering and death of such creatures!! Great post. I’m sure we would all do what it takes to bring out family out of poverty. The large, irresponsible corporations need to change and we as consumers can influence that change with our buying habits. Strong regulation and enforcement will also help. So many moments in this piece transported me David. Thank you! You have a precious gift. Thank you, Margi for such a flattering comment. It is wonderful to hear that the piece evoked such emotions in you. Hopefully it will in others, too. Perhaps reading about what is possible will encourage one person to go and see these incredible beings in their habitat in a way that contributes to their fight for survival. 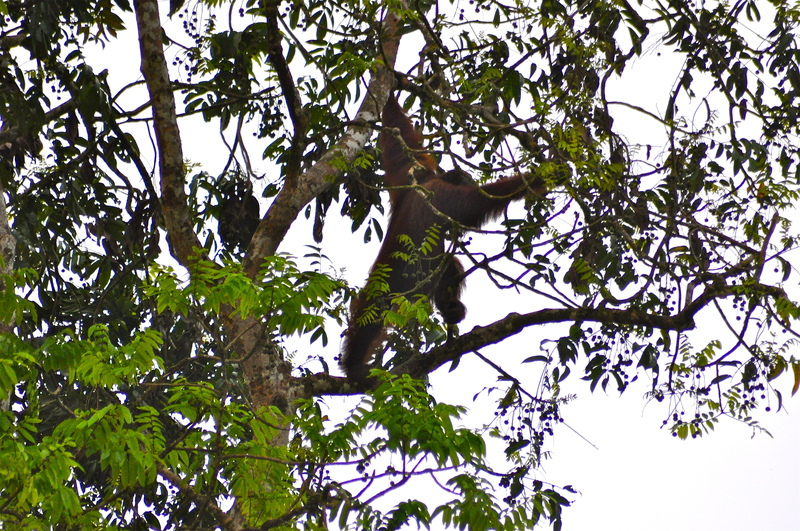 We saw Orang-utans in exactly the same places as you did; Kinabatangan was a good choice as sightings there are almost ‘guaranteed’. Did you stay at the Nature Lodge? Thank you! That is great to hear that you had a similar experience! 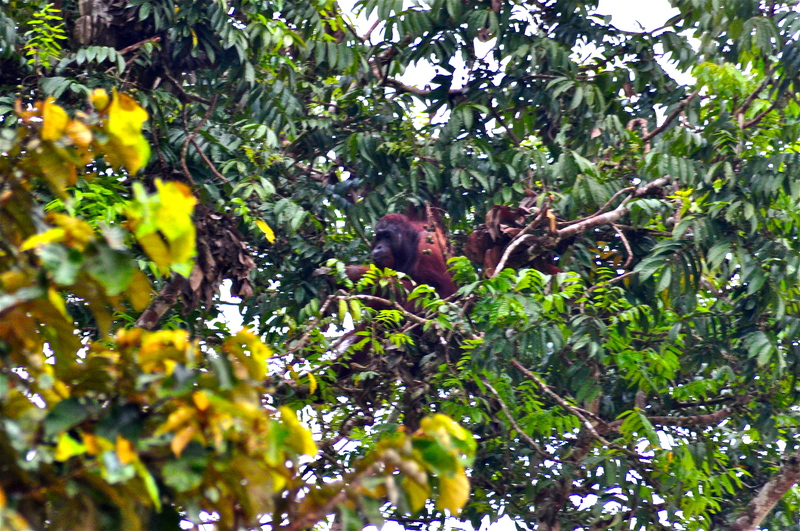 We were both fortunate because there were people at the lodge when I was there who didn’t see an orang-utan. I didn’t stay at Nature Lodge. I think it was Bilit Lodge. Delightfully exciting and passionate post, David. I am in awe of your profound orangutan experiences. To find two in the wild is extraordinary, and how crazy to come upon that looming female while on foot. Thanks so much for your wonderful words here, and terrific photos. Thanks for the amazing feedback, Jet! It was certainly an extraordinary day that will remain with me, always. Hi David. What an amazing experience and beautifully captured photography. Thanks for sharing. Nice job. Thank you for the kind feedback and encouraging words. Much appreciated! Truly love your incredible moment with a wild Orangutan. Awesome! Thanks for the kind words, Tolga! I am now following your blog and look forward to reading more. The monkey sanctuary in Cornwall, that you wrote about, was a place that inspired me as a young child. No worries man, that you so much for your support. The monkey sanctuary proved to be an inspiring place during my time there. I look forward to reading more of your posts and future posts. I have always had a very special fondness for orangutans. I wonderful to have a chance to see them. It is possible! Not, easy but possible. It was an awesome experience. I hope you get a chance to see them some day. What a journey you talk! I have seen articles and videos about the site that you described where the young orphans (?) are being cared for. Borneo always seems so very remote, like going to the end of the world. Really enjoyed your piece. I visited Sepilok many years ago so I was glad to hear it is still going strong. When will people realise the destruction caused by using palm oil? The first time I flew into KL in the early 90s there was little sign of the industry. By the end of that decade the scenery had changed completely. I would be scared to fly over Borneo now as it would be too distressing. Thanks for the comment, Jules. It is heartbreaking to see the forest of Malaysia and Indonesia turn into oil palm plantations, devoid of wildlife. I’m sure that there is still time to turn the situation around if only we can find the political will locally and internationally. So true. And we must continue to lobby and speak out when it matters.